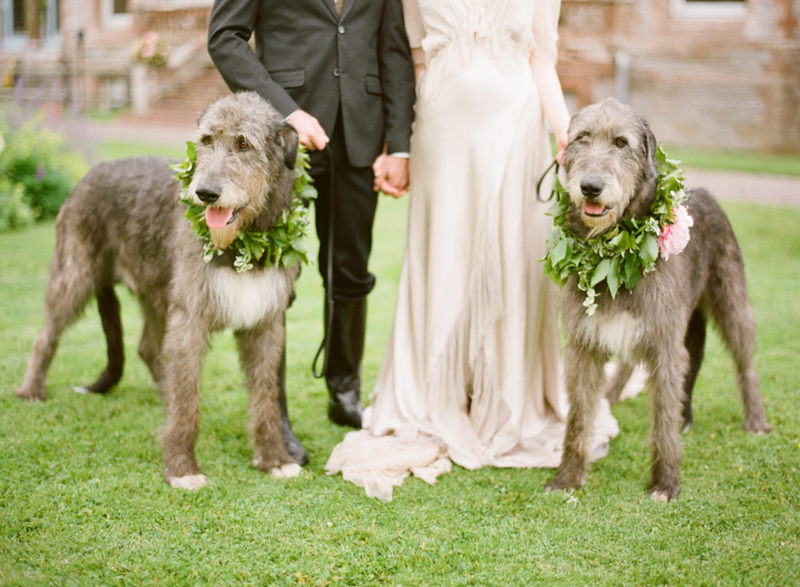 Pets at weddings are always a huge hit! From dogs in weddings to pigs to turtles, many couples nowadays decide to incorporate their pets into their ceremony. Having a four-legged family member join the wedding party is becoming more and more common, and there are plenty of ways to make your favorite furry friend part of your wedding day. While it may take a little more planning and patience to have pets at weddings, having a dog ring bearer, a duck walking with the flower girls, or simply your maid of honor holding your kitten, including your pet will not only delight everyone and include an important member of your life—it also makes great photos. Here are a few things to consider if you’re planning on including your dog in your wedding, or any other pets. Weddings are filled with guests, and most animals can sense excitement and stress. Is your pet able to deal with this level of excitement and stress? Are they good with strangers and children? Do they adapt to new environments well? Are they uncomfortable if there’s loud music? These are all important things to consider before you go buy an adorable tuxedo for your pet to wear. Most do, but some don’t. It’s better to find out sooner rather than later—before you get your heart set on seeing your cat being pulled down the aisle in a wagon. The last thing you want is a wedding guest sneezing or suffering from burning eyes or breathing problems due to an allergy to your pet. For this reason, ask around to double-check if anyone will be suffering if your pet is part of the ceremony—especially your bridesmaids and groomsmen. This is always good to ask before the wedding, but make sure there’s an announcement to the guests before the wedding processional as well. Better safe than sorry! If you’re definitely going to have your pet at your ceremony, designate someone to keep an eye on them at all times. In all the confusion and excitement of your wedding day, a pet could easily get lost or run away. By asking a trusted friend to watch over your pet, you can relax and know that they’re okay. It’s probably also good to find someone who can take your pet home for you after the ceremony. Many couples decide to dress their pet in a little tuxedo or a flower crown. Whatever attire you select for your pet, make sure that it fits properly and won’t pose any risk for hurting them. Note that small accessories could come loose and choke them, and some flowers or plants that you might want to dress them in might not be healthy. Remember: the simpler the better! Train with your pet as much as you can before the wedding. Most animals are very smart and will understand what they’re supposed to do, but it’s wise to train with them as much as possible before the wedding day. Make sure to give your wedding photographer a heads-up that your pet will be part of the ceremony. Chances are your photographer will love this idea, but it’s always good to let them know beforehand so that they can prepare to capture any cute moments. If your pet isn’t good with strangers, it’s probably best to not include them in your wedding. No one is going to appreciate a dog jumping on them in their nice clothes. No one wants a hissing cat near them. No one wants a bite or a scratch. Even a dog that tends to bark a lot around strangers would best be left at home during your ceremony. No matter how much you want them in your wedding, you also don’t want to hear loud, nonstop barking the whole time. When it comes to pets at weddings, make sure your they look their best for your big day! No one wants to experience a musty animal smell, so bathe them, trim them, groom them, and make sure they clean up nice! At Hollywood Banquet Hall, we love when couples include pets at weddings! If you’re currently in the middle of planning your big day and you’re searching for a beautiful Los Angeles wedding reception venue, take a virtual tour of our banquet hall! You can also contact us with any questions you may have. We look forward to speaking with you!